Nitrile is a synthetic rubber that is an effective replacement for Latex. The Sentron, BluRite, BluRite Plus, BluRite XPL, Nitrile N2, NE1, NE2, NE4, NE5 and Touch gloves offered are available with and without powder, and in the BluRite Plus without an accelerator added in the manufacture of the Nitrile. They are all Latex free. A wide selection to choose from in various thicknesses from 2 to 8 mil and including a longer cuff BluRite XPL version. The NE4 offers a chlorinated interior. Nitech® Examination Gloves are made from a patented blend of ingredients, latex free and powder free. This new material is made from a special formula, a blend of polymers that incorporates the best features of the different types of gloves currently available on the market while eliminating the risks of allergies originating from Latex and Nitrile disposable gloves. Its blue color can also be incorporated in a color coding program used to prevent cross contamination. 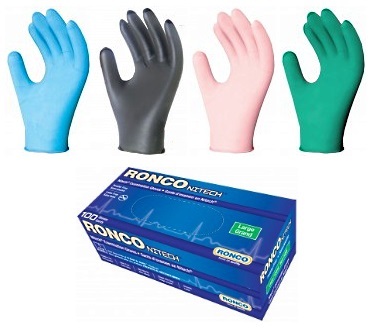 Latex, Vinyl, Polyethylene and other Polymer Blend gloves are also available from Rose Scientific, each with its own advantages and disadvantages. Latex is a natural rubber and has traditionally been used in disposable safety gloves. It is a top performer with high elasticity and flexibility. However some people are allergic to Latex, and the risk can be amplified by the use of powder to make them easier to put on and take off. Vinyl (PVC) is a plastic resin, used in the V1, V1B, V2, V2B and VE2 gloves. The Vinyl used in these gloves is manufactured using “DINP”, a better, safer plasticizer than the “DOP” or “DEHP” that is typically used to make Vinyl soft and flexible. Gloves made of Blended Polymers such as Gold-Touch®, Pure-Touch® and Aloe models have some properties that are superior to Vinyl gloves. The Aloe has an aloe coating on the inside. Polyethylene (LDPE and EVA) gloves are inexpensive and have good feel stemming from their thinness. Also available in full sleeve length. Contact Rose Scientific for samples or long term supply agreements and larger quantity Volume Pricing (VP).